Redirecting to: www.famous-trials.com/oklacity in (10) seconds. Prosecutor Joseph Hartzler: Did you have any discussion [with Tim McVeigh] about the deaths that such a bomb would cause? Michael Fortier: I asked him about that... I said, "What about all the people?" And he explained to me, using the terms from the movie "Star Wars" -- he explained to me that he considered all those people to be as if they were the storm troopers in the movie "Star Wars." They may be individually innocent; but because they are part of the -- the evil empire, they were -- they were guilty by association. 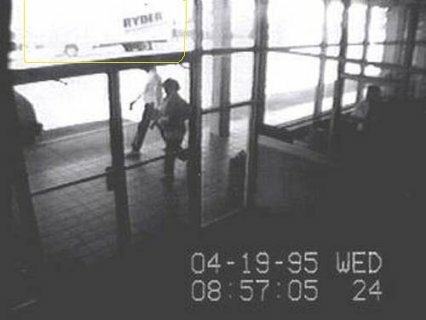 truck driven by Timothy McVeigh, just minutes before the truck blows up in front of the Murrah Federal Building. Prosecutor Joseph Hartzler began his opening statement in the Timothy McVeigh trial by reminding the jury of the terror and the heartbreak: "Ladies and gentlemen of the jury, April 19th, 1995, was a beautiful day in Oklahoma City -- at least it started out as a beautiful day. The sun was shining. Flowers were blooming. It was springtime in Oklahoma City. Sometime after six o'clock that morning, Tevin Garrett's mother woke him up to get him ready for the day. He was only 16 months old. He was a toddler; and as some of you know that have experience with toddlers, he had a keen eye for mischief. He would often pull on the cord of her curling iron in the morning, pull it off the counter top until it fell down, often till it fell down on him. That morning, she picked him up and wrestled with him on her bed before she got him dressed. She remembers this morning because that was the last morning of his life...."